Doing magic with everyday objects is really good fun – this is called impromptu magic. The unlinking drinking straw trick is easy to do and will fool your friends and family every time. The secret to the unlinking drinking straws is in how you wrap the straws around one another. Pay careful attention to the instructions. Practise this one and next time you are out at a restaurant, try it out. Have fun! 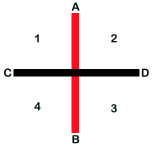 Place the straw in your right hand vertically (|) (AB in the diagram) behind the straw in your left hand (which is in a horizontal position (—) (CD)) to make a cross. 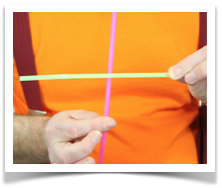 Turn the straws clockwise (from your perspective) so that AB is now horizontal and CD is the vertical straw. The pictures show what your audience will be seeing. Now wrap CD around AB from the front to the back (like shown in the pictures above). 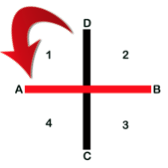 Make sure that the C passed through the top right (2) square. Your ‘knot’ should look like shown in the pictures. It’s time for the magic. Bring the ends of AB and CD together and give a gentle tuck. 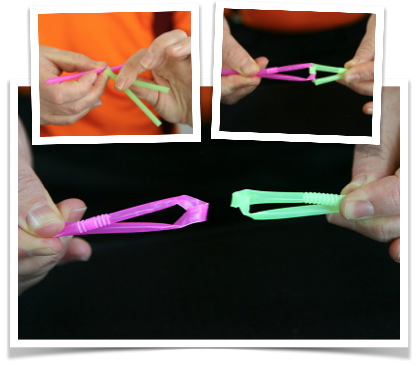 Your straws should now separate as if by magic! 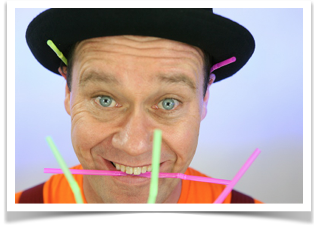 You can do the unlinking drinking straws magic trick. Have fun with this impromptu magic trick and amaze friends and family with your magic! Nice trick,,,I used to buy exspecive trick, over the last 6 year I use house hold i teams,thanks from dave the clown from party entertainments wwwdavetheclown.